In 2013, approximately 6.5 million people were already employed in the renewable energy industry worldwide, a new study by the International Renewable Energy Agency (IRENA) reveals. The study — Renewable Energy and Jobs — Annual Review 2014 — underlines the important role that renewables continue to play in employment creation and growth in the global economy. 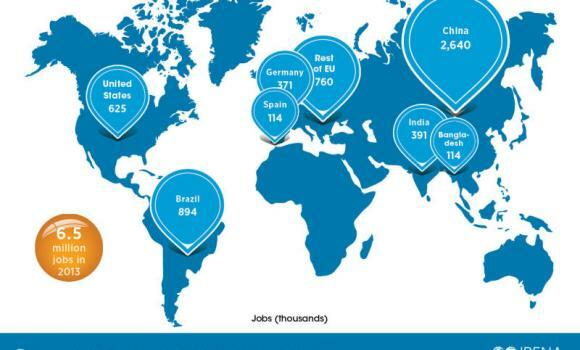 The comprehensive annual review shows steady growth in the number of renewable energy jobs worldwide, which expanded from 5.7 million in 2012, according to IRENA. Renewable energy employment was shaped by regional shifts, industry realignments, growing competition and advances in technologies and manufacturing processes in 2013. The largest employers by country are China, Brazil, the United States, India, Germany, Spain and Bangladesh, while the largest employers by sector are solar photovoltaic, biofuels, wind, modern biomass and biogas. Among other updates, the 6.5 million figure published in the annual review reflects growth in Chinese numbers, which can be attributed to a significant increase in annual installation and manufacturing activity and differences in the way employment figures are estimated. IRENA estimates a five-fold increase of solar PV installations in China from 2011 to 2013. In the wind industry, China and Canada provided positive impulses while the outlook for the United States remains somewhat mixed because of political uncertainty. The offshore wind industry is still concentrated in Europe, particularly the UK and Germany. 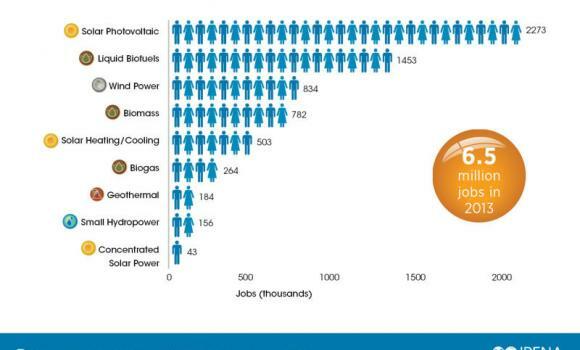 The biofuels value chain provides the second largest number of renewable energy jobs after solar PV. The United States remains the largest biofuels producer, while Brazil remains the largest employer.